I've been online writing about junior mining companies since 2007 and one of the things I've learned is that when doing due diligence on a junior mining stock, it always pays to dig deep into all the information that is available. Just like placer mining, you need to dig deep to reach bedrock in order to get the gold. Too many people when doing their due diligence will just quickly skim over a company website, take a short look at the properties or projects, then take a quick glance at the stock charts and try to make an educated decision on whether to invest in the stock or not. The sad part of all this is that in a lot of cases, a lot of good valued companies and projects get dismissed just on account of the investor not digging through all the information to get the facts. 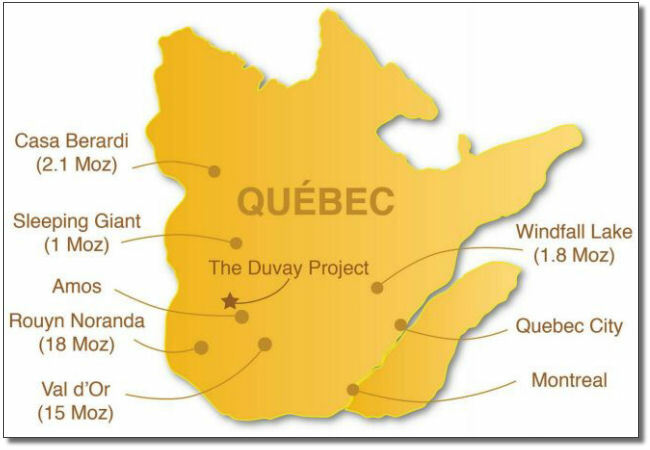 In this article, I'm going to present to you a company called Secova Metals Corp., which is a small gold junior that is active in exploring a gold property in Quebec called the Duvay-Chenier Gold Project and, at the same time, hopefully I can show you how is pays to dig a bit deeper for valuable information so in the future you, as an investor, will be able to make a sound investment decision. First some key facts and information about Secova Metals. Secova Metals Corp. has it's office in Vancouver, BC, and at this time there are three key personnel in charge. Mr. Bradley Kitchen serves as Chairman and C.E.O., Mr. Morgan Good serves as President and Director, and Mr. Pierre-Jean Lafleur serves as the companies geological engineer as well as Director. One of the first things I do when reading about a company is I read the bio's of the management for what I like to call "track record". This will give you a good idea of who is in charge by looking over their past history. In this case we see the CEO, Bradley Kitchen has 25 years of experience in investment banking and leading corporations. Mr. Kitchen also served as the CEO and President of Eagle Hill Exploration until it was taken over in August 2013. A quick bit of research will show that Eagle Hills Exploration was taken over by Oban Mining, which in turn was taken over by Osisko Mining, which is one of the larger gold miners in Canada. In order for a company to be taken over or bought out, that company and project needs to be a success. Proven track record. This is one of the key points I always look for. Mr. Morgan Good who serves as President, has close to 11 years experience as a stock market professional focusing on areas of corporate development, finance, and investor relations. In 2013, he founded a company called Patriot Capital Corporation to invest in both private and public companies. Mr. Lafleur who is a professional geologist, is also a respresentative for some prominent mining software companies, such as SGS Geostat and 3DS GEOVIA. In short, Secova has a strong management team with a proven track record. The company's main property and project is called the Duvay-Chenier Gold Project. This property is located about an hour's drive north from Val d'Or, Quebec, close to the town of Amos. The property is comprised of 174 claims covering an area of over 7,766 hectares. This property is what is known as a near surface high grade gold exploration project. Secova Metals has the option and rights to earn in a 90% stake in this property. By the way, when we talk about near surface high grade gold, it should be noted that visible gold was discovered at Duvay back in the 1930's, which brings us to another important key in due diligence, and that is, studing and researching the property's history. The exploration history on the Duvay property goes back quite a ways to when numerous discoveries of precious and base metal mineralization were made in the Amos-Duverny-Barraute District dating back into the 1930's. All of this work over the years has been recorded and, for Secova Metals, this saves time and money. Having an extensive collection of records gives Secova a real advantage of being able to prioritize the areas of interest and the scope of work along with being able to plan such things as future drilling campaigns. Early exploration started during the years between 1944 and 1948 when the Duvay Gold Mines Company explored the property with drilling and also dug an exploration shaft along with some underground drifts. The company encountered some very high grades of gold at that time. Some of those grades that were intersected were 469.8 g/T over 0.35m; 76.8 g/T over 0.48m; 14 g/T over 0.66m; and 5.89/T over 1.52m. In 1985, the Sphinx Mining Company did exploration work and confirmed the presence of three mineral showings and a second parallel shear zone located north of the main shear zone was also discovered. A 1987-1988 exploration program saw 65,700 sq. meters of stripping and 3,170 meters of percussion drilling along with 7,718 meters of diamond drilling, totalling 40 drill holes and 75 bulk samples totalling 20,000 metric tons. More recent exploration took place from 2011 to 2014, when junior company Tres-Or Resources Ltd. (TSX-V: TRS) explored the Duvay property in part with Aurizon Mines Ltd. Tres-Or drillled 13 holes during that campaign and some of the best analytical results included 83.194 g/T gold over 1 meter. In early January, 2015 Secova Metals made an agreement with Tres-Or Resources Ltd. (TSX-V: TRS) to acquire up to 90% of the advanced Duvay Gold Project. After a year of regrouping and arranging financing, Secova issued news in February 2016, stating the company had started a winter exploration program on the Duvay Gold Project. 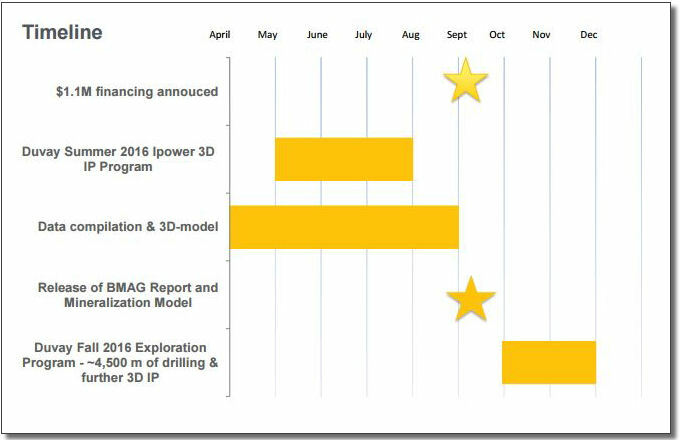 This exploration program was follwed by a spring program, where the company utilized an IPower3D IP Program that was being implemented by Abitibi Geoscience. This new technology enhanced resolution for narrow gold vein structures. By using this technology, the company was able to pin point potential vein structures for a more precise drill target. Once all the information from the IP program was inputted and analyzed along with all the historical data, the company had a new model of what potential ore body or zones would look like. The results showed a defined geological model outlining with cigar-like morphology or shape hosting a high quartz vein density. These veins are very likely to host the gold grade values. These intersections or zones that are cigar-like shapes, are about 50 to 100 meters in diameter to a possible depth of 300 meters. You can view these IPower 3D images here. In September 2016, Secova announced that the company had enough information from all the surveys and data compiled and they were going forward with a drill program. This drilling program will start in the fourth quarter of 2016 and will consist of 5,250 meters in 16 holes on 8 different target zones and will be completed in 3 phases. Phase 1 will be a continuation of geoscientific compilation along with adding information from Chenier claims into a data base. The phase 2 will be the drilling of 5,250 meters in 16 drill holes program to test 8 different targets and phase 3 will be to drill the 5 remaining cigar-shaped anomalies. Secova also has another property call the Jessie Lake property. This property is situated within the Temagami Greenstone Belt, which is part of the Abitibi Greenstone Belt in northeastern Ontario. This property has a number of copper, nickel, and gold occurrences that are similar to the Diadem nickel, copper deposit that is owned by Teck (TSX: TCK) and is located close to the western boundary of the property. In 2015, the company identified several areas of interest and the company has plans to conduct a MAG survey and a followup drilling campaign at a later date. At the beginning of this article I stressed the key points of digging deep into the information that is available. In this short article, we discovered that the managment has a proven track record of running a successful mine. We also discovered that the company has a property of great merit with a history of old workings, records, and data This is a key point, because it saves the company years of exploration and untold amounts of dollars. We also learned about having quailified people in place as an important key point. People who are knowledgeable and have an understanding of new and cutting edge technology that can be utilized to the fullest measure to save time and money so the right desicions can be made. Today there are thousands of junior mining companies to invest in. With the recent rebound in metals and gold in particular, investor's appetite for these kinds of investments have turned positive. Prudent and contrairian investors know all too well that these kind of investments run in cycles. Knowing these cycles there is no doubt that the world has seen the bottom of the bear cycle and the time to look at investing in these types of investments is now. Investors who understand this will be active in evaluating companies and projects that have a lot of positives and this is a catagory that Secova Metals is in. Here is a quick recap of reasons to have Secova Metals on your watch list.